Ours is a busy culture. We’re always seeking ways to squeeze more time into every day through the newest and greatest productivity and time-management hacks. While being productive feels great, the problem is that many of us associate productivity with completing tasks and activities and convince ourselves that if we are more productive, we are achieving more. Unfortunately, productivity does not always correlate to progress, and we end up making ourselves busy instead of making any real and meaningful progress toward important goals in our lives. So, while I can relate all too well to the euphoric feeling of checking off to-do listitems, make sure you have the proper mindset and consider these tips to help you also achieve your long-term goals. 1. Set clear goals with specific actions. Every successful company and organization has a strategic action plan, so why don’t you have a personal action plan (PAP)? This includes setting a personal vision, specific goals, and planned actions. Just know that creating an effective PAP requires time and serious consideration, but at the very least start with a five- to 10-year vision for yourself and three to five important goals that help you achieve that vision. 2. Be proactive, not reactive. Although we are advocating here for making progress, it is still important to be productive — but in a proactive way. That means scheduling dedicated time to focus on your goals and the actions required to achieve them, while avoiding reacting to the nonstop barrage of urgent and short-term tasks that inevitably come up daily. 3. Know that progress requires time. Another false association we have created is the correlating the number of tasks on our to-do list with the level of productivity. While it’s important to break down big tasks into smaller, bite-size actions, remember also that some actions — in particular those associated with long-term goals — simply require more time and energy to complete. Do not measure your productivity on the number of tasks completed, but rather if you have made meaningful strides toward bigger aspirations. One way to help you be more productive and make more progress is learning how to prioritize your action items. 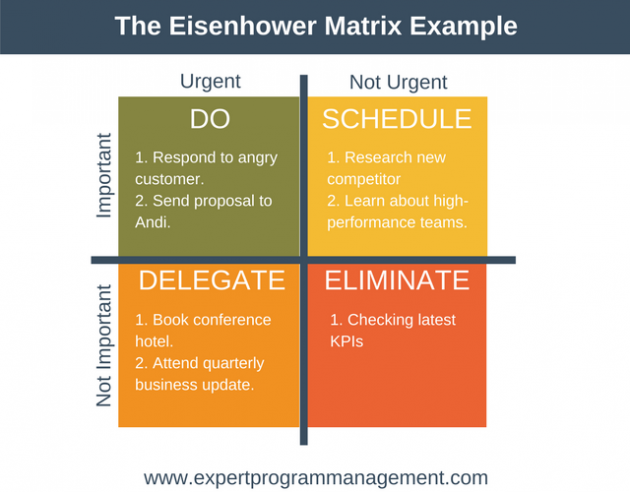 One method taught by many — and one I use — is the Eisenhower Matrix (or Eisenhower Method). The concept is attributed to Dwight Eisenhower, the former U.S. president and supreme commander of the Allied Forces in Europe during WWII, who knew about managing big goals. Eisenhower’s philosophy was to place every task into one of four categories, on the basis of how important and how urgent a task was deemed.